The Galileo Digital Curriculum Platform by ATI supports rapid dynamic curriculum development integrating instruction with assessment to promote learning. Galileo digital curriculums may include multimedia content, technology-enhanced assessments, and tools supporting online synchronous and asynchronous communication between students and teachers. 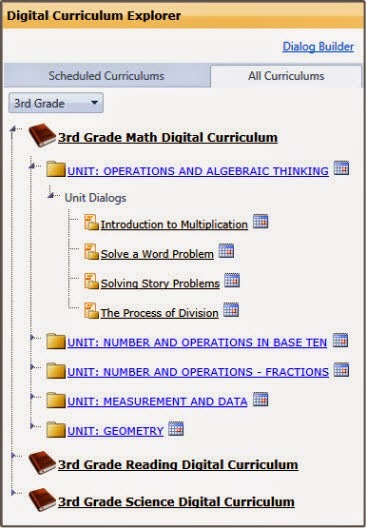 A Galileo digital curriculum consists of two major components: a series of online Instructional Units defining the scope and sequence of instruction and offering a variety of resources to guide instruction, and within each Unit a series of online Instructional Dialogs enabling the online delivery of assessment and instruction. A series of Units can form the complete curriculum for a particular subject and grade. To learn more about ATI’s Digital Curriculum Platform features and benefits, contact us today. The new Digital Curriculum Explorer widget on the Teaching Dashboard provides convenient access to digital curriculums containing Units and Dialogs.